The FIRST® Robotics Competition is the flagship competition of FIRST. A large-scale robotics competition, FIRST® Robotics Competition brings together students and mentors to build robots that perform in a competitive but gracious environment against teams from all over the world. In building their robot and doing all the other things that go with an FIRST® Robotics Competition team, students learn valuable life skills like teamwork, collaboration, public speaking, technical science and engineering skills, Gracious Professionalism®, and others. In Australia, FIRST® Robotics Competition teams compete at the Duel Down Under off-season events or official Regional competitions in Sydney or the USA. FIRST® Robotics Competition is a robotics competition, not a robot-fighting contest - everyone asks. FIRST® Robotics Competition is a robotics competition, not a robot-fighting contest (everyone asks). FIRST® Robotics Competition games are designed to be like team sports, and robots are not supposed to be intentionally harmed. FIRST® Robotics Competition teams are guided by solid principles of teamwork, graciousness, cooperation, camaraderie and professionalism. The game is always as safe as can be ensured, and students are encouraged to be as friendly with other teams as they are with their own. A FIRST® Robotics Competition team consists of high school students typically aged 14-18. These students have to work together to design, build, program and drive robots. Helping them are their adult mentors including industry engineers, school teachers, university lecturers, university students, FIRST alumni and others. These mentors use their experience to teach, guide and shape the students through the FIRST® Robotics Competition program. Also supporting the teams are their sponsors. Be they large corporations with an interest in engineering, the school or university the team is based out of, or a supportive local business, teams are helped by many groups who provide funding, space, materials, tools, resources, mentors and publicity. Without these sponsors, teams would not be able to function. In January each year, the FIRST® Robotics Competition game is announced. This game changes every year, and teams are not permitted to use any robot part they built prior to the game being released so they have to start building a new robot every year. Adding to the challenge, teams have to complete building their robots mid-February, giving them just about six weeks to brainstorm, design, prototype, build, program and learn to drive a robot. The robots themselves are up to 6 ft (2 meters) tall and weigh as much as 120 lbs (50 kgs). Try controlling a 50kg robot from 50 feet away! The game is always played on an 8 x 16m field (try controlling a 50kg robot from 50 feet away! ), and is played by alliances of three teams each. Robots work together to score points, play defense, and fend off other teams. If this sounds like a sporting event, theres a reason for that Dean Kamen, the founder of FIRST wanted to make Science, Technology and Engineering interesting to kids, so he designed a competition where people watch feats of engineering with the same gusto and excitement as they would sports matches. Most games are also designed to be similar to popular sports the 2013 game, Ultimate Ascent, involved throwing frisbees into goals, the 2012 game, Rebound Rumble, involved shooting basketballs into hoops. The 2010 game, Breakaway, involved kicking footballs. And the most recent game is . . . . In order to build the robot during the short build season, teams have to design and build mechanical, electrical and software controls systems, as well as integrate them all into one remote-controlled machine. Students have the opportunity to learn engineering skills across several disciplines, whether theyre interested in shaping and assembling metal, working with electronics, programming controls systems in Java, C++ or National Instruments LabVIEW, wiring up robots, designing innovative mechanisms, or creating complex autonomous programs to autonomously aim, drive and shoot. Team members also learn cross-field skills like Computer-Aided Design (CAD), proper documentation practices, presentation skills and teamwork. One of the missions of FIRST is to spread the love of Science, Technology, Engineering and Mathematics (STEM) to as many people as possible. In order to achieve this, FIRST celebrates teams who spread STEM to their schools, communities, countries and the world. FIRST® Robotics Competition encourages this practice by presenting teams who do this with the most prestigious award an FIRST® Robotics Competition team can win the Chairmans Award. Teams who win this award at the FIRST Championships enter the FIRST® Robotics Competition Hall of Fame. To perform this outreach and present it to FIRST judges, teams may design promotional materials, build websites, create animations, write industry quality business plans, write essays, perform presentations, and more. Naturally, teams do not have to do any of these things to compete in the robot competition¦but these are some of the things that define the spirit of FIRST. Every year, around March, FIRST® Robotics Competition regional competitions are run. Teams from all over the world travel to regionals to compete and earn their way to the World Championship event. Each regional has 24-60 teams competing in the robot game and presenting their outreach to judges. 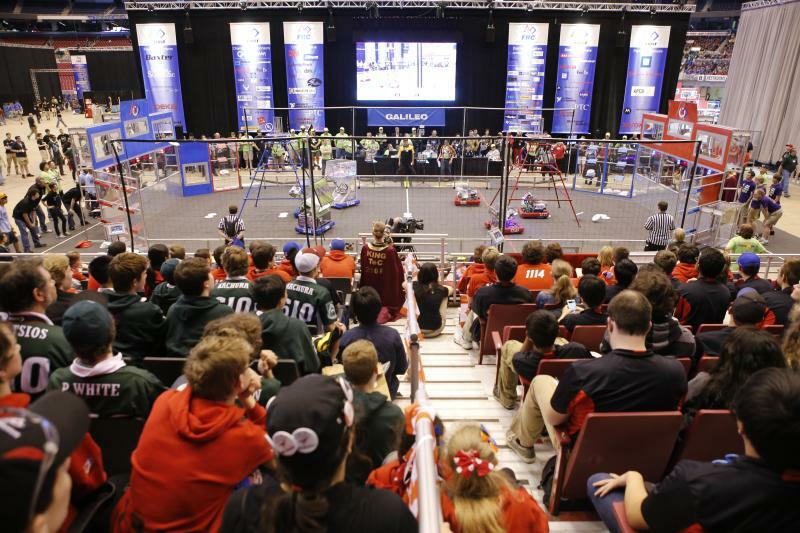 Held in April, the FIRST Championships bring hundreds of FRC teams together to play the game with and against each other. The first Australian FRC Regional was held at the Sydney Olympic Park in March 2015. This successful first-ever event featured 37 registered teams from China, Taiwan, Singapore, USA, & Australia competed in the Sydney Olympic Park Sports Centre. The 2016 FIRST Robotics Competition Australia Regional was again held at the Sydney Olympic Park Centre on 17, 18, 19 March 2016 - featuring 50 teams from USA, Taiwan, India, Singapore, China, and Australia. The FRC program in Australia has experienced phenomenal growth in the last couple of years thanks in part to our Robots in the Outback program (RITO), supported by Google - so much so that there are TWO regionals hosted in Sydney each year! : the Southern Cross Regional and the South Pacific Regional. More information on the Australian FRC regional, click here. In Australia, all FIRST® Robotics Competition teams can compete at the Duel Down Under, held in Sydney. This is an off-season event held each year as a cheaper and easier alternative to Regionals, and is also much later in the year (end of June) to give teams more time to prepare their robots. In the inaugural year - 2012 - 6 teams from NSW, VIC, TAS and SA participated. Currently,the Duel Down Under has grown to an event hosting up to 50 teams from around the South Pacific, including China. If you're interested in starting an FIRST® Robotics Competition team at your school, university, community group, etc¦great! As long as you can get a decent number (10-30) kids aged 14-18, and can cover the rookie registration cost of USD$6500 (subject to change yearly), you can start assembling your team. To find out more, click here.